I love Lillian in skirts or dresses and tend to put leg warmers on her when it’s not quite warm enough to wear the skirts. I found a few tutorials online on how to make them using tube socks. So I bought some tube socks from Target and made a few pairs. This tutorial by Sew Much Ado was the one that I decided to follow. Making these was super easy and quick. It probably only took me 10 minutes or so. There is no measuring and minimal cutting. It will also give you a small chance to see how sewing with knits works on your machine. I used my walking foot but it wouldn’t have been necessary. I think the hardest part about making these was that the cut edges curled like crazy. I am not a pinner (other than on pinterest!) but I found that it was necessary to pin so that I didn’t have to stop sewing every couple of stitches in order to straighten out the fabric. Instead of doing a straight stitch I used my over lock stitch, which gives it more stretch. I actually figured this out the hard way. I made two pairs of these and the first one I did the over lock stitch and a straight stitch; don’t ask why. Because of the straight stitch, I couldn’t stretch the top of the leggings very much and they were tight on Lillian’s legs. So I took the straight stitch out and it was much better. I’m glad I had her try them on before I made the second pair! I highly suggest making some of these for the little girls in your life. They are perfect for potty training time too, and an added bonus is if it gets too warm for them you can get them off over their shoes. 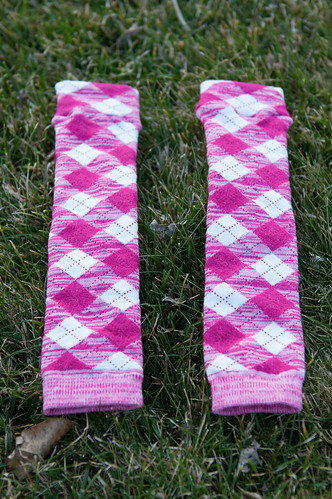 I have also noticed that people are making them for boys as arm warmers….brilliant! What super quick projects have you made lately? Ooh, I love the idea to use an overlock stitch, I’m definitely going to try that with my next pair! 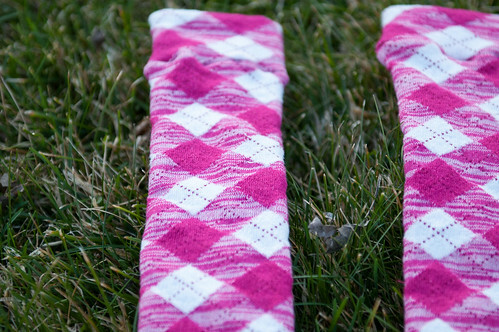 I love the argyle!